My niece is with The Tigers cheer team from Ontario, Canada. We had the chance to see them perform in Virginia Beach over Mother’s Day weekend. I was floored by how good their show was – these girls are powerful forces of nature! I think I was expecting the atmosphere to feel like Toddlers & Tiaras, you know, with a fu-fu feel. And while it somewhat did have that vibe – with glitter cheeks and thick mascara – the show exceeded expectations. The acrobatics, the choreography, and the high level of athleticism was a pleasure to experience. They cheer to dance music with spotlights spinning – so there is a certain concert or club vibe in the air (which is cool ,but was a bit too loud) – and as noted – this modern kind of “cheering” is an ART. The different twirls, the coordination with front rows popping up while a back row bends – while the middle row flips – it is SO cool. 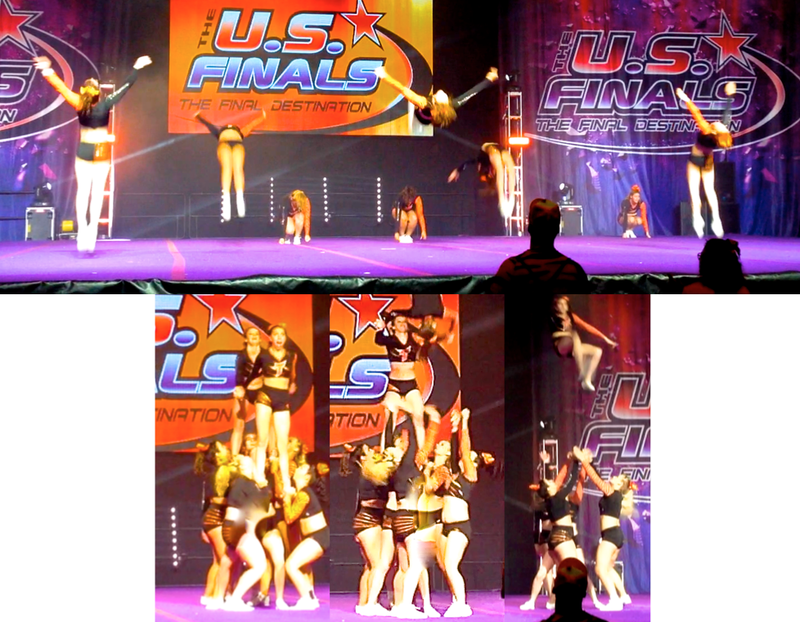 They also integrate traditional pyramids and classic cheer moves. This is my niece, Alexis. She is Canadian and she has been in gymnastics and sports since she was a toddler. Alexis is strong, but don’t let her tough side fool you – because she is kind and has a smile that warms your heart. 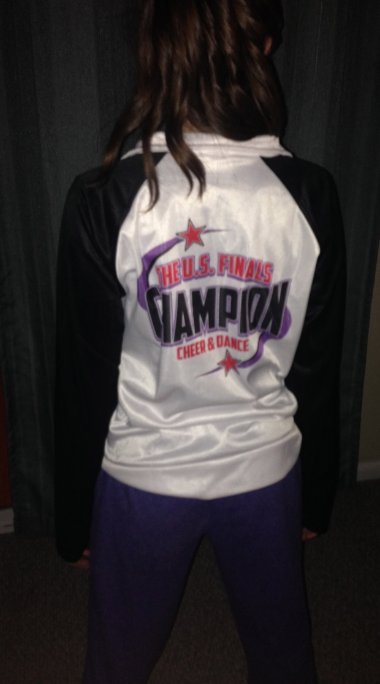 This is her first year in cheer and she said she enjoys this competitive league. 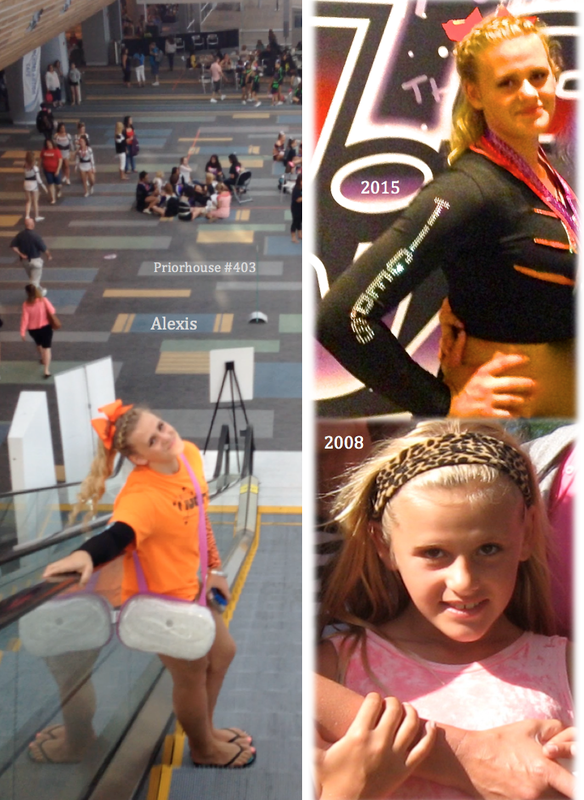 With her gymnastics background, she has brought strength to the floor routines and tumbling segments. I guess that “hair bows” are the big thing here. 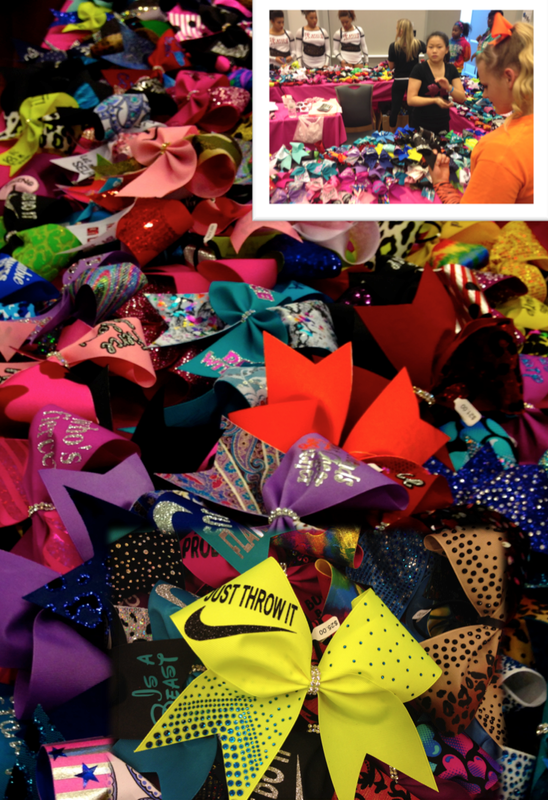 Some bows sold for more than thirty bucks, and they also had a “build-a-bow” workshop in another part of the center. Someone was making some dough, that’s for sure. A mixed collage to give u a feel for walking around at this event. We were told that “selfie sticks” were NOT allowed – but we did see a few folks walking around with them (upper right). 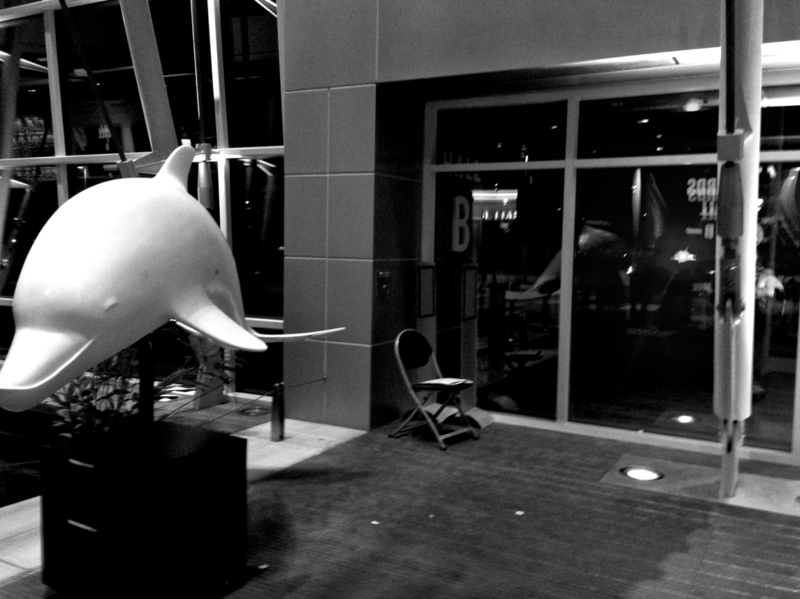 This photo, with the dolphin, empty chair, bit of trash on the ground – and slight reflection – is linked to Paula’s B & W.
For part 2, let’s finish our walk by going outside of the convention center. The Virginia Beach Convention Center has some architectural flair – but don’t let the sweet design fool you – because this structure is also quite tough and it can handle the forces of nature (like hurricanes) and the cloudy sky in this photo is linked to JNW. Here is the rest of the convention center – at dusk – with some more green lights to the front (yeah). This shot, with all of the lines and angles – is linked to Cee’s fun foto challenge. Here is the beach, which is a few miles east of the convention center – the smooth sand and sea foam is linked to narami’s week 20. Forces of nature – forces of man. Forces of nature take two. There is something about this photo I just really like – and it is one of my favs from this post. What about you…. do you have a favorite photo from this post? Well thanks for dropping by and I hope you have a great day. For more forces of nature posts, check out the daily post. And for more walks with restless Jo – go here – where this week she brings us to Krakow. thanks K – the sun is not too strong at this time – maybe in the 80’s that day – and my niece did have fun. It must have been nice to see the girls competing for this competition! laughing pretty good thinking of you doing a front flip Jo – which would not surprise me if you did you restless one. and yes, having a nice week and sweet month so far – also – welcome back from all your traveling – I am sure you are still catching up…. Looks like a good time was had by all! Most interesting details. The elongated selfie is quite cool. thanks Debbie = and it was sunset on the east coast which gave that effect. and it really was the perfect mother’s day weekend because my son did all the driving and he is racking up hours for his learner’s permit. He experienced his first traffic jam on the ride home – and handled it so well. – we were in stop and go traffic as we entered the tunnel on 64 – yawn -but he cranked the music and was just enjoying it. thanks so much mon amie – and yes, we call them suckers – ha! I forgot about those subtle linguistic differences – and just FYI – I say “soda” and not “pop” – what about you? What an exciting event and your niece is gorgeous! 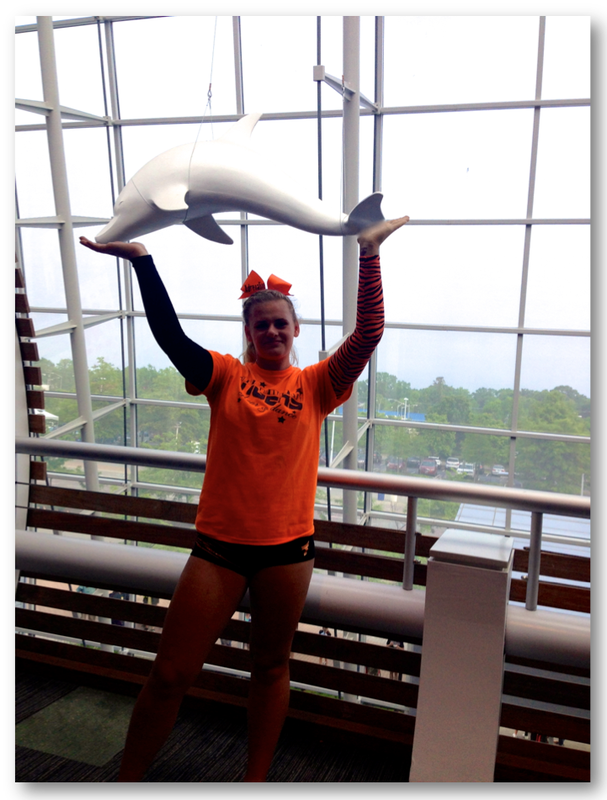 I love the dolphin shot. Them girls must be hard-to-achieve girls. 🙂 Your jump shots are cool too! thanks so much Rommel – and high achieving girls for sure! Excellent choices all, but I had to smile at the series of teenaged cheerleaders, even if you hadn’t been related. Lovely! My favorite, Y, is Alexis with her head demurely bent on the escalator. 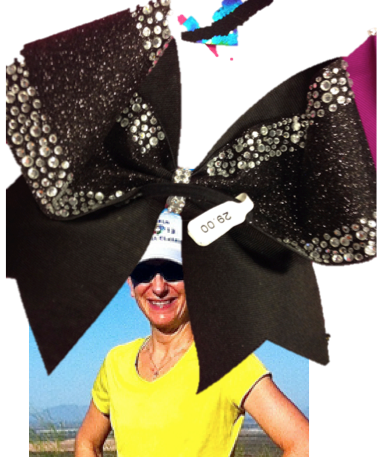 Second fave is the endless oodles of bows. I love the concept of these acrobatic and tough young women working at cheering as a sport, Y. Part art for its creativity and movement, part performance for its competition and athetic requirement of physical conditioning and excellence. Thanks for bringing me to the event, Y. Now I’m off to go to Krakow, Poland, with one click! That looks like so much fun. Glad to know it wasn’t a toddlers and tiaras cousin. Love the photo at dusk. You really packed it all in this post! 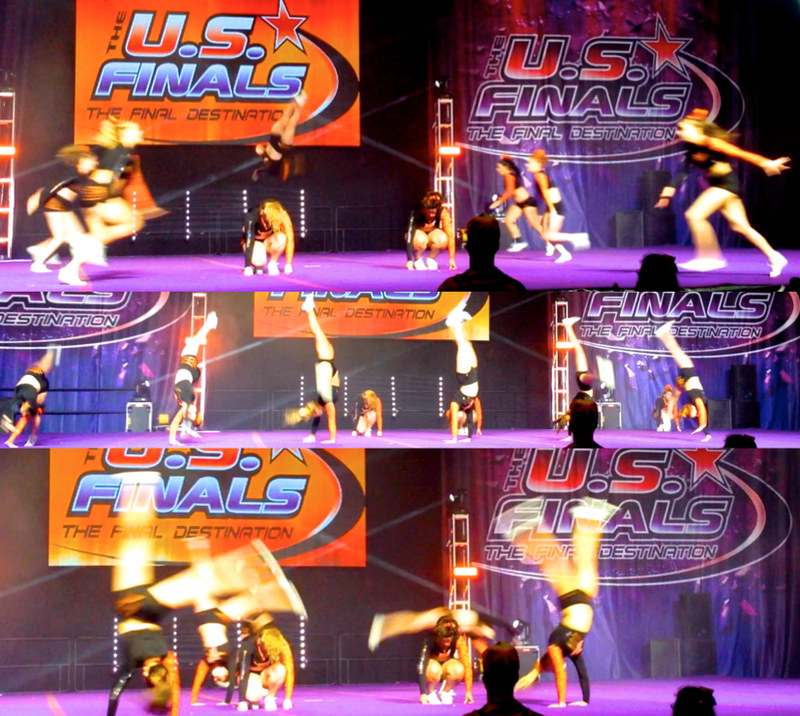 My fav photos have to be the action shots at the top as I was a gymnast about 100 years ago. And your niece is a doll! I know you like the acrobatics and I can picture your granddaughter in her unbelievable poses…. and the building – well for osme reason when i saw it- as we turned off of Atlantic Avenue- I just thought of one word “upgrade” – and tear down that old structure and make way for the new – like it might be all moldy, or salt weathered – or just behind the times with 60’s and 70’s faucets and nasty vertical blinds – ha! out with the old and in with the new for a better beach experience. ha! These are wonderful. I’m quite drawn to the lollipop melting on the ground for some reason. Looks like it was a great time seeing your neice cheer! Thanks for linking to the OWPC, that convention center with cloudy sky looks so moody. Beautiful Niece you have my friend and very talented too! Family events are always good fun. Thanks Linda – and yes, their cheer team is in what you would call the “competitive” league (versus the rec stuff) – and don’t rush on up to Virginia Beach – because without sounding mean – it is actually kind of – um, I can’t think of any word for it. You know how Daytona Beach is considered the number one blue collar beach – well this is similar and it is “our” most accessible beach – but truly nothing to write home about (IMHO) – even though the beach is the beach – sand and salt water really are enough for my soul – but I think Hilton Head, Nag’s Head, and a few of the Carolina beaches would be more enjoyable.